The Samsung Galaxy S line will see a major incremental upgrade next year, with the arrival of the Samsung Galaxy S9, and the Samsung Galaxy S9 plus and now you’ll also see a mini variant. 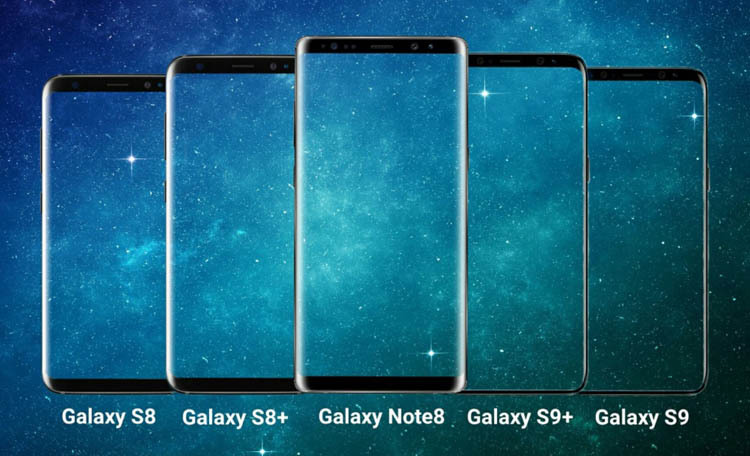 You can see in this comparison which starts with the Galaxy S8, from the left to the Galaxy S9 on the rightmost side, while the Galaxy Note 8 sitting in the middle like a king, you get an idea about the screen size as well as the overall bezels of all the three devices. If you look closely, you can see the Galaxy S9/S9 plus are of the same size, but a larger screen size is achieved by shrinking down the bottom bezels, on both the devices, while keeping the top bezel. And in this art, we can see they’re too slim and thus be making the device more prone to damage when it’s dropped. It is reported that the device will retain the almost bezel-less design of its predecessor, although, in contrast to previous rumors, it will not use a 21:9 display. A recent report also stated that the smartphone will have a 5.77-inch display, which is comparable to the 5.8-inch display that the Galaxy Note 9 sported. The US variant of the device will probably be powered by the Snapdragon 845 chipset from Qualcomm. This SoC is comprised of an octa-core Kryo 385 CPU and the Adreno 630 GPU, and the semiconductor company claims that the product offers 25 percent performance increase and 30 percent improved graphics rendering compared to the Snapdragon 835 that powers the Galaxy S9’s predecessor. Also based on the leaked image, the Samsung Galaxy S9 will be made of metal and glass. Samsung will probably launch the Galaxy S9 at the Mobile World Congress 2018 which will take place in February next year.